High deworming efficiency with small dose of drug. Suitable for medical feed mix preparation by any available method. Essential for combined rehabilitation of fish-breeding unit. 1 g of Fenomix contains 80 mg of phenasalum as an active ingredient, as well as excipients. It is an antihelmintic drug. Phenasalum (a component of the drug) has cestodocidic effect on all development phases of tapeworms parasitizing in fish intestine. Mechanism of action includes phosphorylation damage in worm tissues, blocking of main energy processes, neuromuscular system paralysis causing worm fixation loss on intestinal mucosa and elimination from gastrointestinal tract. Use to treat and prevent cyprinid bothriocephalosis and khawiasis. Do not use in other types of fish. It is not allowed to use in half drained ponds. Use with feed stuff. Single group administration in dose of 0.5 g/kg of fish body weight. Mixture of feed stuff and the drug is prepared in feed stuff factory or in farm by adding Fenomix to feed stuff (10 kg per 1 ton of feed stuff). 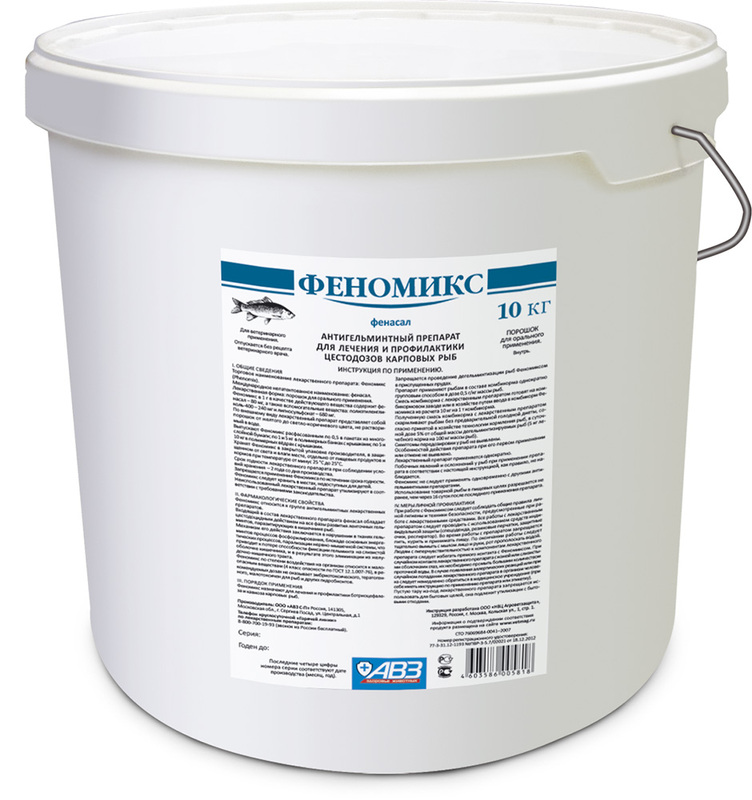 Feed fish with obtained feeding without previous starvation diet according to approved feeding technology. Daily dose is 5% of total weight of fish to be dewormed (5 kg of mixture per 100 kg of fish body weight). If water resistance of mash bolus is <30 minutes, deworming efficiency will be decreased. Commercial fish can be caught and eaten not earlier than 16 days after the drug administration. Adverse events and complications are not generally observed in case of administration as per package insert. Store carefully in original package. Protect from moisture. Keep out of the reach of children and animals. Store separately from food and animal feeding at <25°С. Shelf life is 2 years from manufacturing date.